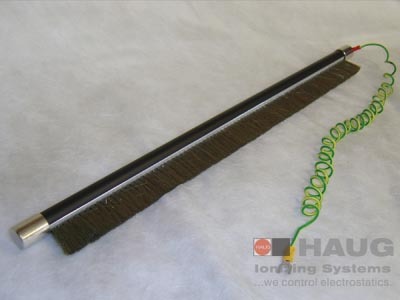 The brush ionizer (BI) is a passive ionization bar and reduces static charges with very high field strengths on material webs – preferably case in combination with an active ionization system. The partial discharge of a material web is effected (contact free) via the fibre brush of the brush ionizer. The charge equalization of the high field strengths is possible due to the grounding of the brush ionizer. The brush ionizer is mounted at a distance of a few millimetres from the material web. If the brush ionizer (inadvertently) comes into contact with the material web during operation, the web will not be damaged due to the flexible brush fibres. The use of passive ionizers reliably reduces the very high field strengths on material webs by means of a controlled charge equalization. During the downstream processing steps, this reduces the danger of uncontrolled charge equalization (spark formation) between the material web and the conveying elements or the operators. Significantly fewer suspended and other particles settle on the charge-reduced material web. Passive ionizers are often used in addition to a HAUG ionization system with active ionizer. In such a set-up, the passive ionizer is installed upstream from the active ionizer 1). This combined application results in a multi-stage ionization with reliable discharge of very high field strengths on the material web. HAUG ionization system have become almost indispensable in the packaging, film and sheet, printing and textile industries as well as in many industrial applications. We recommend the installation of one brush ionizer each above and below the material web. This serves to increase efficiency and to ensure smooth production processes, in particular in film and sheet processing. 1) Suitable holders are available for direct installation of the passive ionizer at HAUG ionizing bars – refer to reverse.